This is the first time Monster Hunter actually has a story. 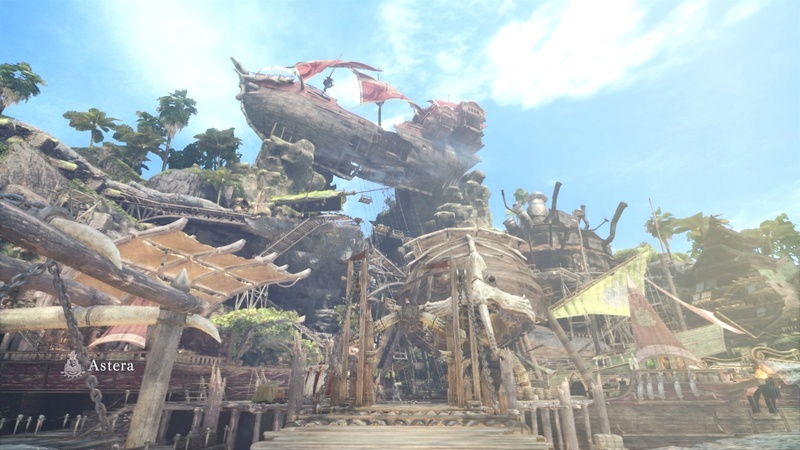 It begins as a farewell to the Old World of Monster Hunter and a voyage on a ship to travel to the new world. Everyone aboard this ship is apart of the Fifth fleet unit. Aboard the ship, you discover that you are an A-Lister and as such you are assigned two partners to accompany you on your travels. As you meet your partners and starts introductions your voyage comes to a complete stop as the ship crashes into a volcano... However, upon closer inspection, it's a massive monster! This is your partner that will help you on quests. 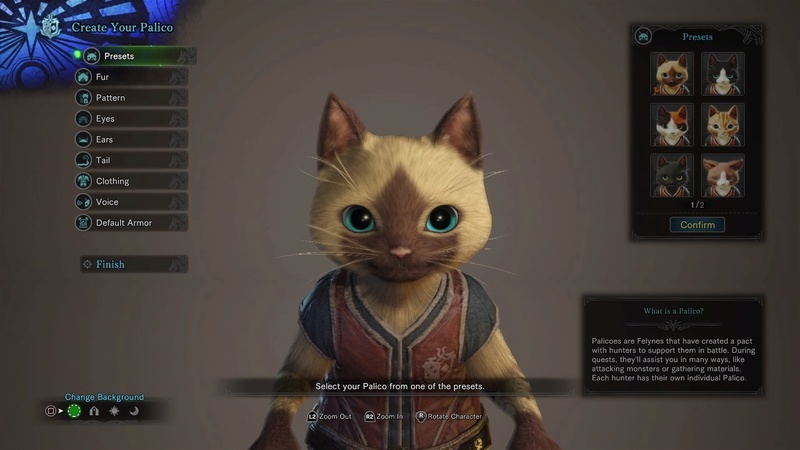 It's a Palico (Cat) and they are awesome! This is your second partner. 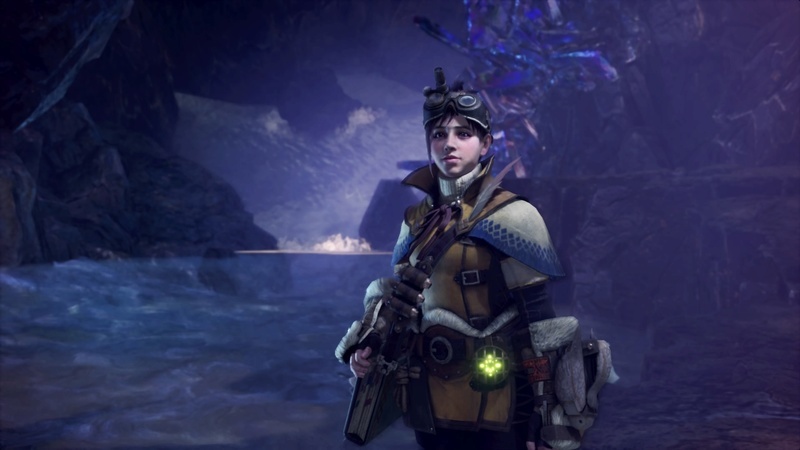 The Handler (Looks like Tracer from Overwatch) she moves the plot along. The monster is so huge it wears a volcano on it's back! 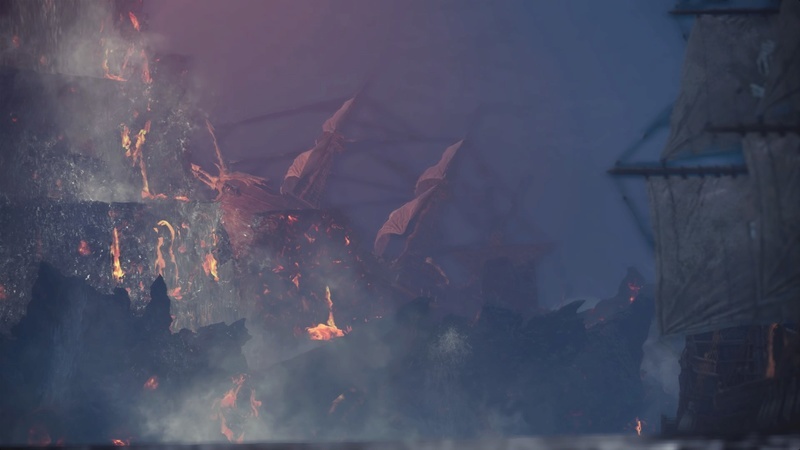 Dealing with such a massive foe is impossible for one hunter and your only option is to escape and make it to the base in the New World. Thanks to your partner quick thinking and your proficient skills both of you manage to escape the clutches of the monster and make it to the new world main base. This base called Astera, you'll be introduced to your Commanding Officer (CO) the research team, blacksmith and everyone else who is important. Despite being new you are given tasks such as securing Astera from surrounding threats, help the researchers and figure out what is that monster? How did it get so massive? And what was it doing? All these questions and more can be answered by playing. Do not ask me how that ship got up there. I have no clue. 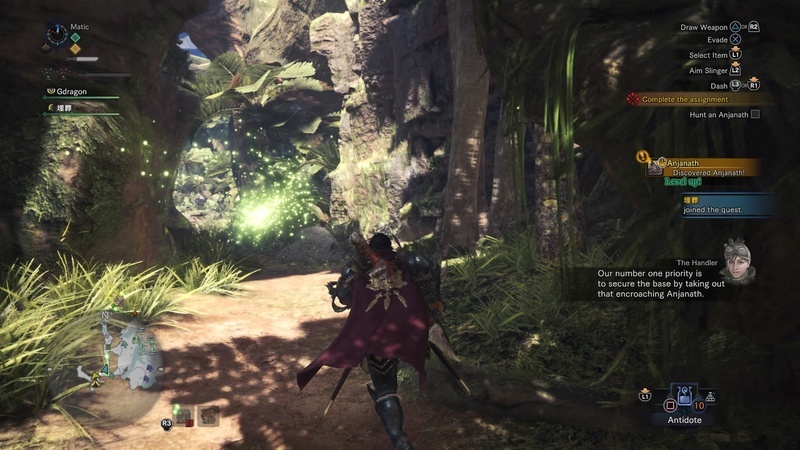 In Monster Hunter World you take on the role of being a Hunter. Your job is very simple. 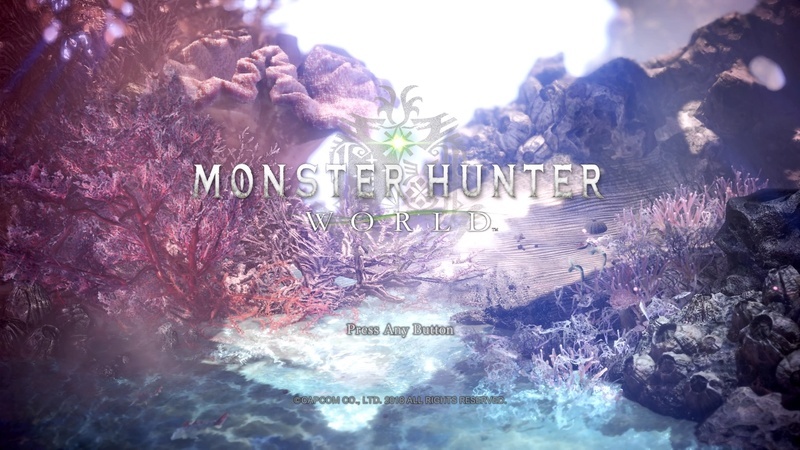 You take on various requests from people from picking up ingredients such as mushroom and wyvern eggs to fighting large dangerous monsters that breathe fire, causes bad storms, or mess up an entire ecosystem. Taking out large monsters is a rather tough job, so you are given a chest that contains armor and fourteen different weapon types. The hardest question is what weapon to pick? There is a lot of options. There are fourteen different weapon types and this can get rather complex for beginners of the series to figure out which weapon to start with. However, there is a testing ground you can access by talking to the housekeeper cat in your room. You have fast weapons such as sword and shield, dual blades, and long swords, then you have the slow heavy hitters which falls under Greatsword, Hammer, Lance, and Gunlance. Then you have the technical weapons that have a high skill cap since these weapons are way more complex to use. Those are Light/Heavy Bowguns, Insect Glaive, Charge Blade (Easily the most complex) and a Bow. Once you find the weapon you are comfortable with you can start with the missions. The areas that the mission takes place are massive! There is a ton to explore in each area such as finding waterfalls, underground caves, beautiful serene areas and so on. You can climb, swim, swing vines, open up shortcuts, jump from massive heights without taking any fall damage whatsoever. Upon exploring you'll find resources such as ores, spiderwebs, fish, herbs, bugs, ivy and so much more. You can use such items in the massive crafting system to make new items such as combing a thunderbug and a trap tool to make a shock trap which works on large monsters or combine a potion with honey to make a mega potion that heals more than a regular potion. The crafting system is super easy to learn since the game tells you exactly what you need to create X item and if you have ??? as something to create. The game will check to see if you have the right materials to even make it and if you do, you can start it. And if you forget where you get the resource. Check your map and it will have the location of where you can find the materials again. And they will stay on your minimap as you approach it or view all the resources you found by opening the map. So much easier to find stuff in this game! Now the large part of Monster Hunter World is hunting Large Monsters and these fights are awesome. In this installment you now have a special tool to help you which are called Scout flies, these little guys light up anything that can help the player out. The flies will lead you to footprints, saliva, and markings of large monsters by hovering over them. As you continue to follow the tracks of the monsters your Scout flies will slowly become better at finding Large Monsters to the point where they can already locate them on the map when you start a mission and know where the monster will head to next. However, keep in mind Scout flies will hide if you enter combat and won't come back until your out of combat. 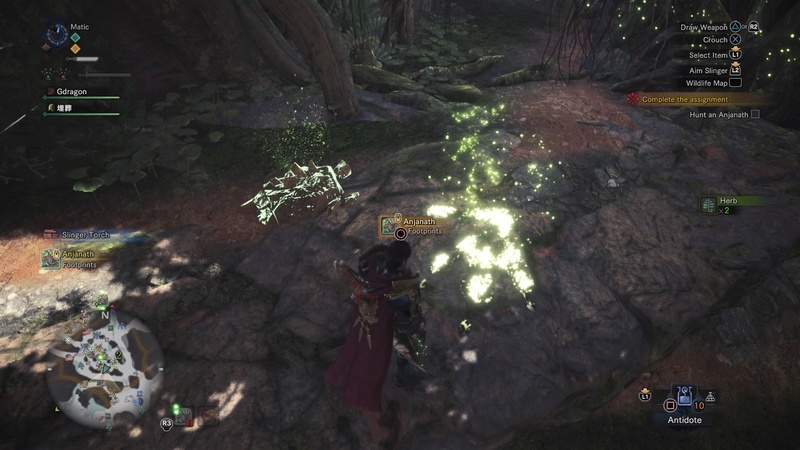 Sometimes you can actually find monster drops from searching foot prints. 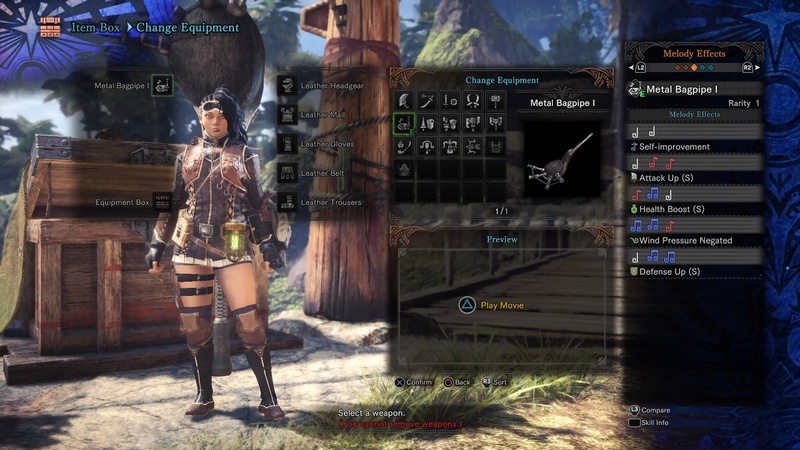 You can sheathe or unsheathe your weapon by pressing either Triangle or some cases R1 (Each Weapon has different controls) when you attack your enemy you will see numbers indicating your damage which is new to Monster Hunter. Once you defeat a monster you can carve them to obtain new materials. You can use these materials to create new gear for your hunter or sell them for cash. However Large Monsters is a bit different these guys function like boss battles. Each and every single fight begins with the monster roaring at you. Then from there, the battle begins. As you continue to do damage to it, the monster behavior changes and becomes more aggressive. During this state monsters may start breathing heavy, flames coming out of its mouth, or possibly seeing electrical energy coming out its fur. It will do everything in its power to defeat you. If you do get defeated you are carted back to the nearest camp the player has unlocked. You can faint up to a total of three times in a mission. However, the penalty for fainting is a decrease in the rewards. Once you deal enough damage to a monster it will retreat to another area. To continue the fight chase the monster and keep pounding it down. The final stage of the fight is when the large monster starts limping and it will retreat to its nesting ground to sleep. Here you have two options you can kill it and carve out the spoils or capture it with tools. Of course, you can't carve it if you decide to go with this approach but you will get more rewards than the killing method. 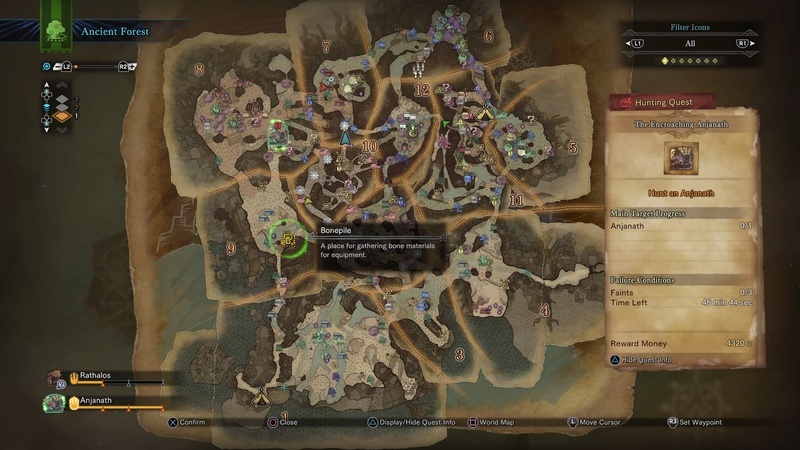 After you finish the mission you get mission rewards which range from money, gathered materials monster parts if you have hunted any and others. Occasionally you will get Hunter Rank experience (HR exp) This rank is tied to the story and it determines what missions you can do/ join in. Once you beat the story the HR cap is removed and you can keep leveling up by doing quests. Your HR does not give you increased health and stamina or anything, all it does it let you able to join in quests if you meet the requirement HR. The game online is quite confusing at first. When you start up the game you asked if you want to create a party or just join an already made party by matchmaking. 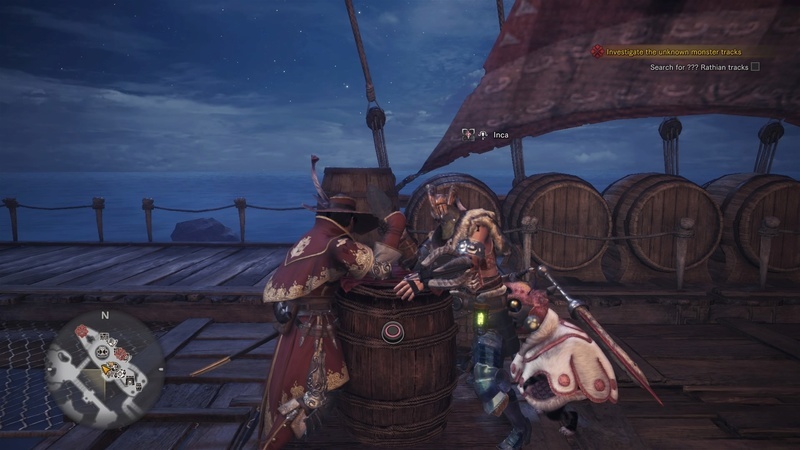 Once you wait for that long loading screen you're able to party with people in that room and join in whatever quest they are doing. You can also join in mid-quest as long as there is room. Up to a total of four players can join in with the exception of some investigations which have special conditions. However, it's highly not advised to join a quest after the ten-minute mark has passed. If a player decides to join after that time they will receive no rewards from completing the quest you only can obtain what you get from picking up during the quest. When playing online you get items called lucky vouchers which used on a quest will grant you bonus reward money and items when successfully completed. You get one daily and can only hold up to a maximum of five. Another benefit of playing online is that they often have special quests that give unique limited time equipment such as From the Horizon Palico armor, Ryu & Sakura outfits from Street Fighter V, Sealed eye patch to look like Zoro from One Piece and so much more. There is also a Gathering Hub where you and everyone in the lobby can team up, take on special arena quests and just regular quests. It's also the only place where you can see other players characters other than missions. There is also an arm wrestling event you can do in the hub. And do not worry about not finding people, in this game you can play with players from all around the world. I have played with Canadians, Europeans, Chinese, Japanese, Korean, Germans, The French, and players from countries in Africa. There is no global restriction what so ever, and you can find a room/hunt any time of the day it's that popular! This guy thinks he can mess with The Red Baron, this sucker must of lost his mind! These things have been added to make things way more easier for the player. It's so good it makes it hard to even go back to the previous titles! 1. Players do not need to make room for Bugnets, Pickaxes, and fishing rod, your character will automatically carry one and it doesn't take up inventory space. 2. Players can now move and run while drinking potions/ eating food this is a much-needed feature! 3. There are multiple campsites in the game. To save you players from going nuts here some advice. Forest Area and Desert areas are the only places that have a total of four campsites. Some just have two or three sites. 4. In camp, you can change your gear, obtain items from storage, heal up, eat food, create items from storage and put them in your bag. This is wonderful if you happen to forget something important! 5. No loading screen when switching to zones! 7. Players are now given a health gauge of monsters stats by looking at the heart rate monitor at the bottom of the screen. It looks just like an EKG (Electrocardiography) When its Blue and spiking the monster is going strong, If it's like flat line blue/ orange that could mean the monster is very tired or it's about to die. So useful! 8. I love this feature. If you hate grinding monsters for parts you can do missions called investigations which may have special limitations such as only fifteen minutes, only two players can join, can only faint one-two times for a failure. However, it gets guarantee special rewards from the monster drops ranging from bronze (Common), silver (Uncommon) gold (Rare) if you can complete the mission. Just one of the many cut scenes you will see in this game. It's wonderful! There is not really much to say about graphics. It looks like Square Enix created the game and Square Enix is the King of Graphics. Cutscenes are beautiful, the NPC's (Non-Playable Characters) when doing tasks are fleshed out, I love the chef scenes when they cook food for the hunter! However, there is one slight nitpick I have with the game graphics and that's when it comes to weapons. It seems like the artist developing the weapons seems to lack imagination most of the base forms look exactly the same for many weapons until you reach the second part of the game. They could have done better with weapon designs, other than that it's perfect. It's great. Every Large Monster has their own theme song. Each one sounds like a drastic battle. Outside of combat, they serene easy to listen to music and the town theme fits. The music simply fits the game very well. Simple, get the normal version. The deluxe version comes with some gestures that are meh at best however it does come with two items. 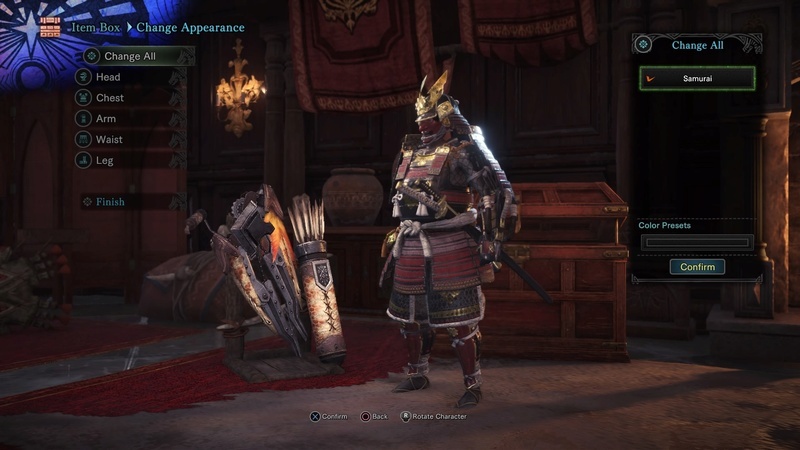 A Samurai outfit which you can wear over your armor and the fair wind charm. The farm wind charm can be easily replaced as you progress in the game. Looks exactly the same on males and females. This game is just amazing! This game is so popular the week when it came out Sony PlayStation Network crashed multiple times just because of this game, apparently, they couldn't handle how many people were on the servers. As of now, I hear stories on how hard it is to find a physical copy of this game. They had to travel to multiple stores just to find a copy. You can't go wrong with this game if you pick it up and it's clearly the best entry for those who want to start playing. @Dragons_Rule, Sorry for the late reply. The servers are constantly active many of the players are in the high-rank mode as of now. Not too many are in low rank which is the first half of the game. @Pennsage Um...what a nice review. 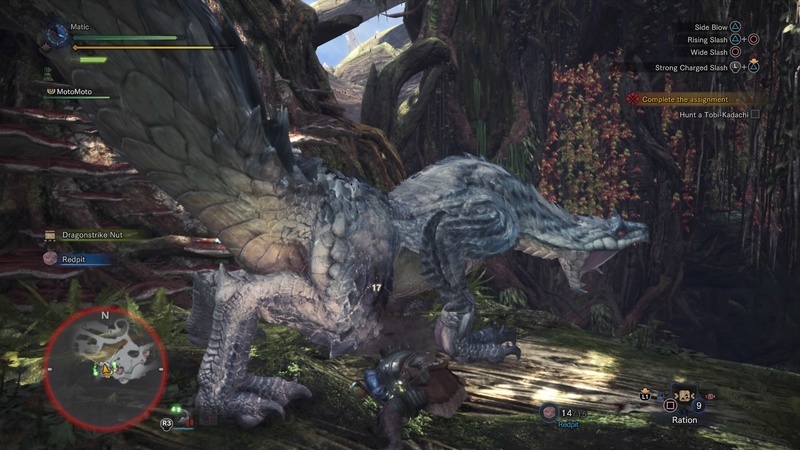 Monster Hunter World has been amazing! Excellent review @Pennsage!